ServiceNow, Inc. (Service-now in 2011) is an American cloud computing company with its headquarters in Santa Clara, California. It was founded in 2004 by Fred Luddy. ServiceNow is listed on the New York Stock Exchange and is a constituent of the Russell 1000 Index. ServiceNow was founded as Glidesoft, Inc. in 2003 by Fred Luddy (the previous CTO of software companies Peregrine Systems and Remedy Corporation), and later incorporated in California in 2004. Luddy had previously served as chief technology officer for Peregrine Systems, an enterprise software company based in San Diego, until 2002. In founding the company, Luddy intended to provide the same services previously available from the then defunct Peregrine Systems. Until mid-2005, Luddy was the only employee and concentrated on developing the software which the company would offer. Most of the early software that Service Now was based upon was "lifted" from the Xanadu project from the defunct previous company Peregrine Systems. Slowly but surely, the main engineers from the Xanadu Project, David Loo, Paul Morrison, & Bow Rugeri were poached and brought some of that IP over to what would become service-now. Then came the first hires, five people, and raising US$2.5 million in venture financing from JMI Equity. In 2006, the company changed its name to ServiceNow. [unreliable source?] 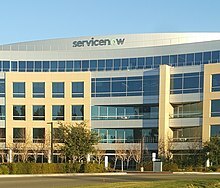 In 2007, ServiceNow reported an annual revenue of US$13 million and opened their first Silicon Valley office, in San Jose. 2007 was also the first year that the company "went cash flow positive". As of January 2011[update], the company had 275 employees in its San Diego, Chicago, New York, Atlanta, London and Frankfurt offices, as well as a partnership with Accenture who had more than 100 ServiceNow consultants. At this time, the company was known as "Service-now". By April 2011, the company had named Frank Slootman as chief executive officer. In June 2012, ServiceNow became a publicly traded company following a US$210 million IPO. Shortly thereafter, the company relocated its headquarters from San Diego to Santa Clara, California. It was the first technology company taken public by Morgan Stanley since Facebook. In 2017, the company acquired the San Diego human-centered design firm Telepathy, which had been founded in 2001; the acquisition doubled the size of ServiceNow's internal design agency, the Design Experience Organization. In 2018, ServiceNow acquired FriendlyData, a company specializing in a form of natural language processing that enables queries to be asked in plain language. As of 2011[update], ServiceNow was a software-as-a-service provider, providing technical management support, such as asset and license management, to the IT operations of large corporations, including providing help desk functionality. The company's core business revolves around management of "incident, problem, and change" IT operational events. Their fee model was based on a cost per user (seat) per month, with that cost ranging down from US$100. ^ a b c Bigelow, Bruce V. (August 9, 2011). "San Diego's ServiceNow Driving Hard as Revenue Soars; Expands to Silicon Valley". Xconomy. Retrieved 2018-05-11. ^ a b c d e Bigelow, Bruce V. (October 3, 2017). "Xconomy: ServiceNow Buys San Diego Specialist in Customer Experience, Design". Xconomy. Retrieved 2018-05-11. 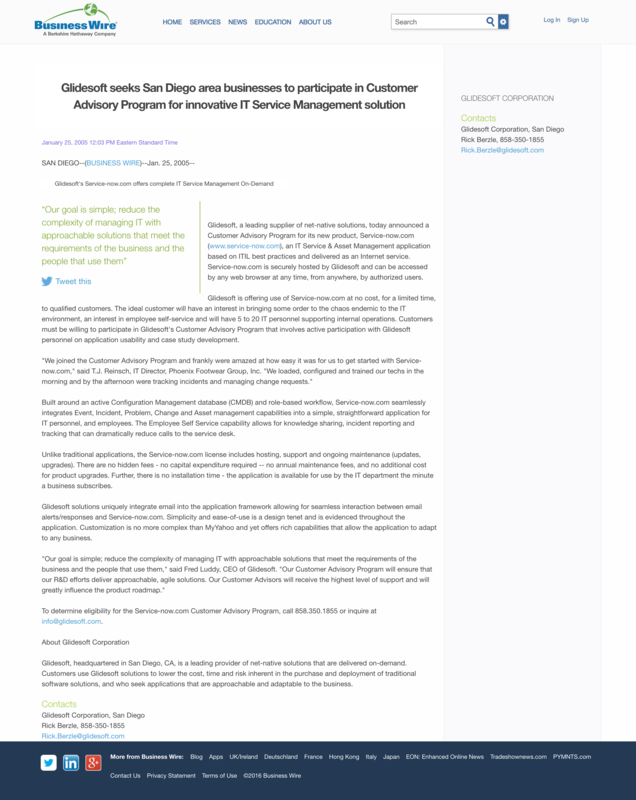 ^ a b "Glidesoft seeks San Diego area businesses to participate in Customer Advisory Program for innovative IT Service Management solution" (PNG) (Press release). GlideSoft. January 25, 2005. Retrieved 2018-05-11 – via BusinessWire. ^ a b c d e f g h Bigelow, Bruce V. (January 11, 2011). "Xconomy: Service-Now CEO Fred Luddy Sees a Clear Path to $1 Billion in Annual Revenue". Xconomy. Retrieved 2018-05-11. ^ Noshee (October 17, 2014). "Service Now — Leading cloud provider passes with flying colors" (Blog). Financial Markets Wizard. Retrieved 2018-05-11. ^ Spears, Lee (June 29, 2012). "ServiceNow Advances in Debut After $210 Million IPO". Bloomberg News.